A poor local boy called Matthew; after finding out that serious money is to be made from fighting on the street enters a local competition. He wins his first fight, makes some money and gets himself a manager, Doug. Soon he becomes a feared and renowned street fighter called Street President or “Preso” as his manager calls him. Tied to the streets it is only the love of a woman that takes him out of it, but the pull is strong and though his body is out of the streets his mind is still there. You know it’s a Tchidi movie when as soon as you pop the disc into the player you are assaulted by his music. First we see the video for his telephone single. You know that tune used to get on my nerves. Now I find myself singing it. I swear I know all the words! The self promotion doesn’t end there. There is a next tune and then the plugging of the album GOLD. See I know the name of it. Shameless plugging does work. Does Matthew not think it odd that the guy pushing himself to become his manager dashed away his current charge, a millisecond after the guy lost the fight to run after a new anonymous guy who he has only seen fight ONCE? I guess this was meant to show us that Matthew was that good a fighter. To me it was not believable and Matthew should have at least pulled him up on that, because the same way he dashed the guy that he was managing would be the same way he could dash Matthew in the event that he lost a fight in future. Added to that how are we meant to believe that Matthew is a formidable street fighter and his physique does not even match? Nonsense! Casting correctly is essential. Acting well is one thing, but the person chosen has to really fit the role and I don’t believe Mike fit the role. Matthew is an orphan, didn’t pass secondary school, lives in an unfinished building and is desperate for cash. Why on earth does he look so clean, well dressed and then to top it off well spoken? He did not make a believable street boy to me at all. I thought he was too much of a pretty boy for the role and even then they could have had him looking and sounding rough and local like the other street fighters we see in the movie. So Mike falls ill with hypertension. He is a young man and supposedly fit enough to be a street fighter and he has hypertension all of a sudden – YEAH RIGHT! That would be very odd, and there is no explanation as to what would have caused a fit and healthy young man to be suffering from hypertension to the extent that he is fainting in the street and has to stop fighting. So many things were just unrealistic in this movie. We are given the impression that Doug truly does not like his “baby mama” as he calls her but then one day they get back together all of a sudden. I found it all so fake. When Doug would go and visit the son he was made to talk to him outside of the compound because his mother did not like him or want him in the house. She found his lifestyle abhorrent and was not in support of it. I could believe that she started falling for him again because of the immense love he was showing towards his son, but no when she tells him that she has not stopped loving him, on one of the outside the compound visits she tells him that she wants him back because of the fact that he son loves and accepts him for who he is and so she will too. Rubbish! Why all of a sudden do you think street fighting and smoking is ok when you didn’t previously? A kid will accept his father no matter what, even if he is a killer. Since when do adults measure their actions and decisions on a kid’s? The time line in this movie was fugged! In part 2 Matthew stands up to his bully boss and tells him, “I’m that kid they call the Street President because I mad my name on the streets.” However we never see him winning numerous fights or making this name he is boasting about. Pretty much as soon as he started he got into the fighting game he got hypertension, fell in love with Nene and came out of the biz. Perhaps more effort should have gone into mentioning previous wins even if they were not going to be shown, so that we could get an idea of how big his reputation was before this scene. In Part 2 Matthew and Nene break up because of his flirtations with a girl in his dance class. Even the execution of this was disappointing. Matthew had never shown signs throughout the film of being a womaniser in any way. Even when Calista approaches him in the street and is madly flirting with him he seems not to notice or be interested in her. So how on earth did he go from not even noticing her when she was throwing herself at him to practically drooling over and molesting her during an aerobics class ALL ON THE SAME DAY? This did not make sense at all. I liked the girl who played the orange seller in the movie. I’m assuming she is credited as the rice seller as I don’t remember any rice seller, so for now let us assume her name is Chinaza Ekpere unless Chinaza comes to come and debunk that. Her role was small but she played it well, interpreting fear without overacting it as would have been so easy. I’d like to see her in a bigger role to see what she can really do. “Eh heh, money will come?” she says walking away. Mike’s performance was adequate in that he did his thing but the characterisation was all wrong. Chika Ike was just there. I find her such a boring actress. She has no charisma at all. Jimmy B was good but could have been better without all the Americanisms, but then that was probably scripted so not really his fault. Tchidi did well keeping to a minor role. He actually wasn’t bad at all. I would say the movie is worth watching if you have nothing better to do. The story line was something different to the usual and in spite of all the things that were nonsensical it is an entertaining watch. I guess the message it was trying to put out there was that people should be accepted for who they are because some things can never been changed and even if they are it is only temporary. Please, contact to Jimmy B (Jimmy Y Bangura), I'll so grateful if U do help me out. Sorry I don't know him ooo! You are so right, Calista's part was so funny, i really wanted to see her again. She really cracked me up. You know that. The funniest part was at the ex boyfriend's house when she relaised she "don fok up"
the orange seller girl's name is SOCHIMA EZEOKE.we want to see her in bigger roles cos she interpreted her role very well without over acting. Thanks for letting me know I will amend that! Thank you for the shameless plug collette. You are welcome any time. 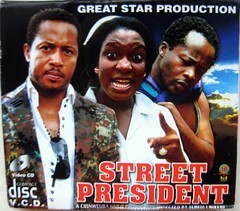 Nollywood films make us to be proud as African people…May God bless every 1 who is de part of dis industry..Love u all..